Hello all, sorry for the long silence. I’ve been busy with many things, including the holidays, and activation as a military Reservist, where I am now once again on active duty, presently in Texas for the next 7 months. Afterwards, I’ll return to “normalcy” in Los Angeles. 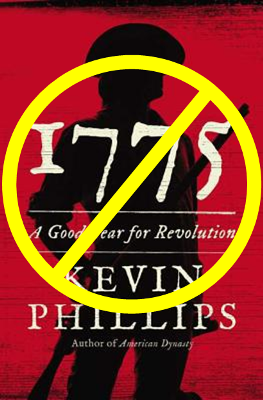 Late last year, my trusted colleague J. L. Bell (of the blog Boston 1775) informed me via Twitter of a forthcoming book by nearly the same name as mine: 1775: A Good Year for a Revolution, by successful history author Kevin Phillips. Naturally, I was mortified. Thanks for letting us look at the proposal for 1775. Unfortunately, with… the upcoming November publication of a competing book from Viking, we don’t think this is right for [us]. After hearing this news from Knopf, I proceeded to frantically search Viking’s website for the supposed competing book, though I found nothing. Then came J. L. Bell’s aforementioned warning a month or two later, which gave me the title of this competing book for the first time: 1775: A Good Year for a Revolution. Ugh. And then around Christmas 2012, when I was hitting the stores, I saw that the book too had hit stores. My heart sank as I saw a book that was not mine, sitting on prominent display at the front of a Barnes and Noble, with “my” title appearing on its cover. I’ve received a few emails since then, including one asking whether my book was associated with this one. Except for the obvious title similarity and subject overlap, I have no association with that book. What’s going on with my 1775? Well, though the manuscript has long been finished, it’s been slow going, the primary reason being that I am unestablished as an author, and the publishing industry has become squeamish with taking on new authors. In fact, a few publishers have now formally declined my project because they have determined I do not have sufficient credentials, this despite the quality of writing that even they had to admit. I am trying to overcome this “credentials” issue with endorsements by bona fide historians, and have secured one, with another potential one in the works (he’s reading my manuscript now). So, where to next for my 1775? My agents remain optimistic. So, I have a reading assignment: I must read Kevin Phillips’s book, “his 1775”, so I can redesign my book proposal to explain how mine is different and why it remains deserving of publication. I will post back here with my summary on that. And by the way: I couldn’t bring myself to buy this book, for how can I aid sales of a book that directly competes against mine? So, I naturally borrowed it from the library. In the meantime, thank you all for your continued support, and wish me luck as I read the “his” book and make notes as to how mine remains worthy of publication. Tagged behind the scenes, updates. Bookmark the permalink.